A few months ago, I obtained my dream: an Icom IC-7800 for a reasonable price. It was a second-hand unit, from Poland. Marcus PA2DB helped me obtain this rig. Being one of the first IC-7800's from the production line, it needed updating to 'Rev. 2' with the upgraded roofing filters, and tons of other modifications. I made an appointment with Amcom, our Icom importer here in the Netherlands, and they did the work on all the modifications, prescribed by Icom. The procedure took 2 days. In total there where about 16 minor modifications, and a few more intensive modifications, including replacement of the receivers. In my opinion, they did a pretty good job, upgrading this fairly complex and expensive rig. It took 2 days including testing. I spoke with Amcom after they completed the update. They had some 'trouble' but I did not ask for specifics. My guess is they encountered the problem described below. Suddenly the rig did not response to the AF gain knobs. Being more a computer than a radio, this could be something 'software related' and I rebooted the rig. No avail. I tried anything: "All clear" reset, re-flash Firmware 2.11 etc. all with no avail. I took a closer look to the behaviour, trying to 'reasoning' to the fault. The behaviour was as follows: No Audio, no AF gain response, no relays switching the bandpass filters, the Digi-Sel relays which normally rattling while tuning the VFO are unresponsive. The receivers seemed to receive normally, but were stuck on on a random frequency. Also, there was no RF output on TX. So my conclusion was: OK the 'computer' part works fine, the display and all indicators are working, but the 'radio' part is unresponsive. This must be a communication failure between the 'computer' and the 'radio'. I moved the IC-7800 from its HAM-Shack location to another desk, and connected a power cable. Power-On and the rig was working just fine! This confirmed what I thought earlier: this MUST be a flat cable sitting loose in its connector. Anyway I returned the rig to its normal operation location, and it worked just fine. Until...The next day. 2nd Easter day, in the morning I powered the rig on: no audio, no band relays... NIL. I immediately sent an email to Amcom, and explained what happened. We went to do our thing on the 2nd Easter day. After we returned, I tried the rig. Still the same. I decided to remove the top cover to see if I can find anything loose causing this abnormal behaviour, and moved it (again) to another desk. Again tested the rig, to see if moving it solved the problem. Not this time.... So I removed the top lid. This time I powered it up with the top cover removed. Alas, it worked as advertised!! Audio from the speakers, and the band switching relays working just fine! I took an hour to inspect all connectors and band cables. Checking coax connectors etcetera. And there are a lot of connectors! Finally I gave up, and decided to return it to Amcom to see if they can find anything. I was just ready to put the cover back on, when I noticed a ribbon cable running between2 sheets of metal, one of them for supporting the top cover. The black screw was replaced to illustrate the location. The screw normally holds the top cover in place. On this picture you see the power supply with the fan. On top is the BPF unit. The white flat cable was the problem! 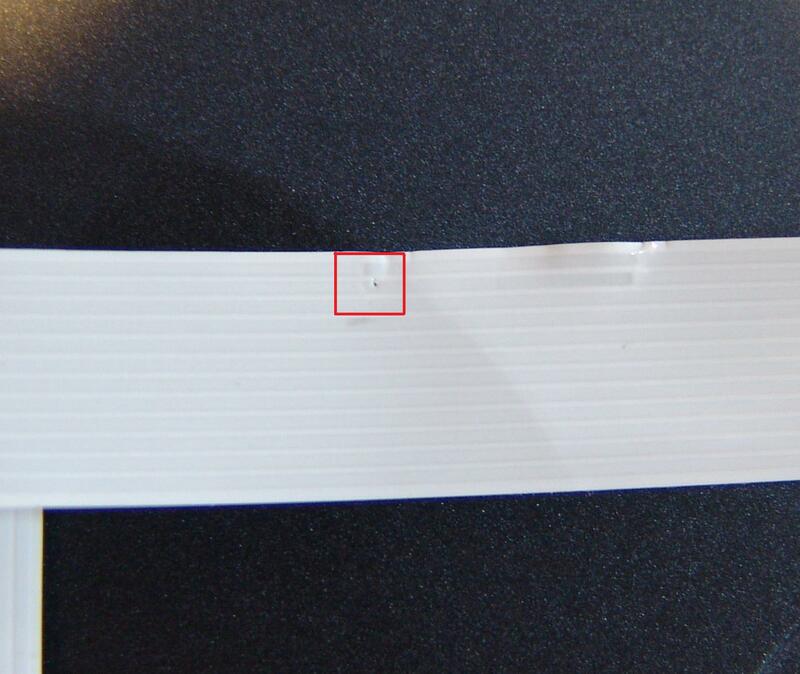 Carefully, I removed the ribbon cable and checked it with a microscope (I have an SMD/SMT repair workstation) and noticed the ribbon cable was punctured, probably due to a sharp edge of the sheet-metal resting on the ribbon cable. Quickly, I traced the wire in the service manual, and it appeared to be one of the data lines of the BUS (BPCKA) in the IC-7800. That makes sense!! Also, I could easily reproduce the fault by connecting this BUS line to ground! 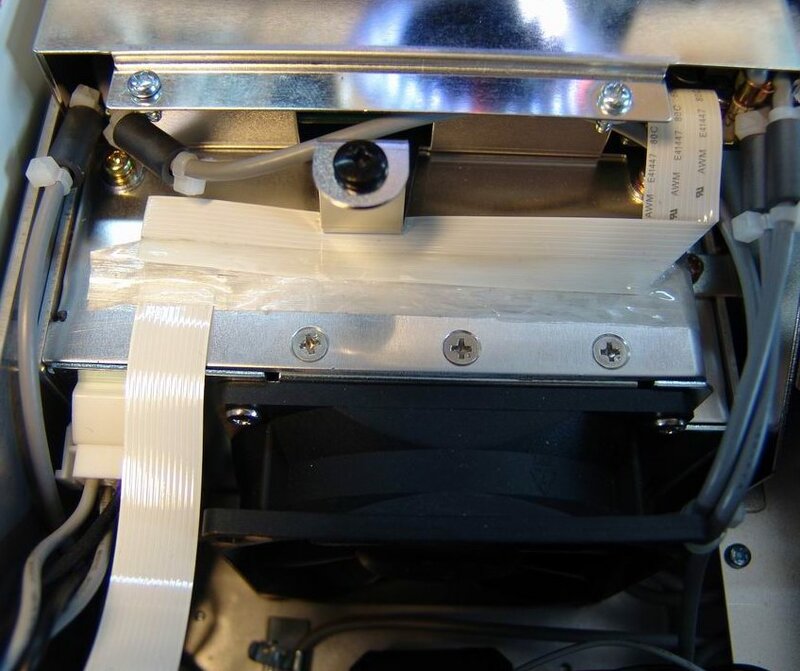 The fix was easy: relocate the cable, and secure it with Capton tape. The pressure from the top cover, and friction on the cable caused by the replacement of the screw, caused this failure. 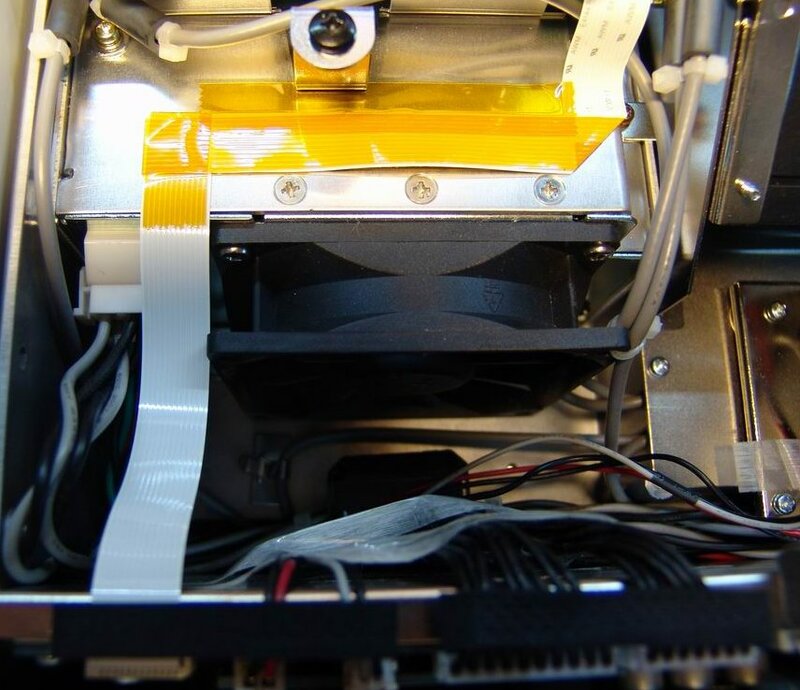 During production, the cable is placed on the power supply (using tape) before the BPF unit is mounted. It is possible that your rig has the same potential problem. You can check it out without removing the cover, if you use a flashlight shining through the vent holes just behind the power switch. Check it, and correct it if necessary. It is a 5 minute job. I shall make sure Icom put this in their list of modifications. Text & images copyright © 2008 R. Rosenberger PA7FA.All rights reserved.